62 | TH E M R EP O RT O R I G I NAT I O N S E R V I C I N G DATA G O V E R N M E N T S E C O N DA R Y M A R K E T THE LATEST GOVERNMENT How Policy Can Help Housing Affordability One housing expert points to zoning laws, tax code, and housing vouchers as ways to promote affordability and accessibility in the housing market. T his year, proposals have begun making their way to Congress aimed at helping ease the tight supply and rising prices that are preventing many—particularly low-income Americans—from finding affordable housing. How- ever, Jenny Schuetz, a David M. Rubenstein Fellow at the Met- ropolitan Policy Program at the Brookings Institution, called the proposals thus far "mostly partial fixes that do not address the underlying problems in the U.S. housing markets and policies." She made her own recommen- dations on how federal, state, and local governments can "improve the affordability, availability, and equity of housing outcomes for U.S. families," in a recent post on The Avenue, Brookings' blog. Her recommendations include four major themes. First, "level the playing field between renters and owners"; second, "stop strangling supply in high-demand locations"; third, "help poor families bridge the gap between income and rent"; and fourth, "housing policies alone cannot save places harmed by past policy failures." In terms of "leveling the play- ing field," Schuetz said, "A key part of leveling the playing field is eliminating preferences for home- ownership in the federal tax code, namely the mortgage-interest deduction and the capital gains exclusions for owner-occupied housing." She pointed out that the 2017 Tax Cuts and Jobs Act "moved in this direction." She said current laws that incen- tivize homeownership were "un- fair and economically inefficient." These laws penalized millennials who were delaying homeowner- ship longer than generations past, as well as people who lived in areas where home prices were leveling off or declining. Schuetz suggested cities revise land-use regulation and develop- ment processes that make it more difficult for multifamily develop- ment than for single-family home development. 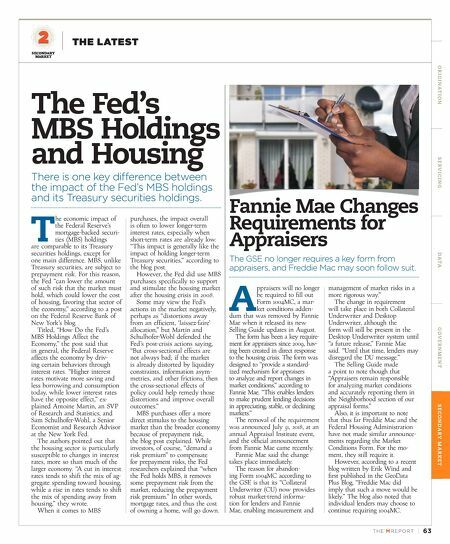 Similarly, she called for revi- sions to zoning laws in order to help bring more supply to competitive markets. Referencing California and the Northeast, she said some markets are "artificially constrained by excessive local land use regulation." While these zoning laws can benefit current homeowners in these markets by inflating their home prices, she said the exces- sive zoning ultimately detracts from economic growth. She called out Sen. Cory Booker's (D-New Jersey) proposed Affirmatively Furthering Fair Housing rule, which charges com- munities that receive Community Development Block Grants with creating "a strategy to support inclusive zoning policies," saying California "already requires locali- ties to specify a plan 'to meet the housing needs of everyone in their community' in their comprehensive plan, yet those same localities con- tinue to under provide housing." While the first two themes Schuetz addresses will help middle- class households, she also addresses those in the lowest income rungs. Only one in five families eligible to receive federal housing assistance actually receives assistance. For these families, the "most di- rect solution" is housing vouchers, an earned-income tax credit, or a refundable tax credit. Lastly, Schuetz suggested for the communities suffering from high vacancies and blight caused by past policies, future housing policies may not be enough. "Rather it will take sustained investments in human capital, infrastructure, and targeted economic development strategies to help people in these communities," she said. 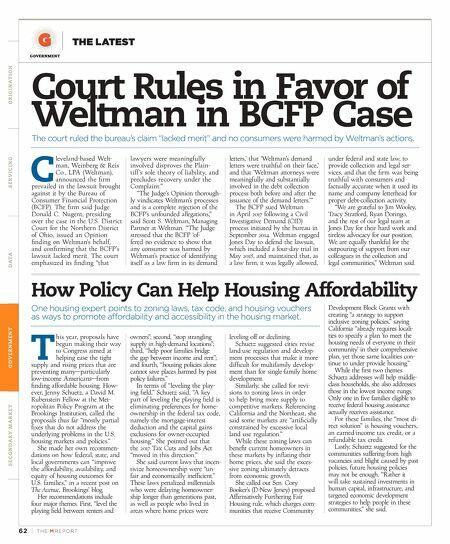 Court Rules in Favor of Weltman in BCFP Case The court ruled the bureau's claim "lacked merit" and no consumers were harmed by Weltman's actions. C leveland-based Welt- man, Weinberg & Reis Co., LPA (Weltman), announced the firm prevailed in the lawsuit brought against it by the Bureau of Consumer Financial Protection (BCFP). The firm said Judge Donald C. Nugent, presiding over the case in the U.S. District Court for the Northern District of Ohio, issued an Opinion finding on Weltman's behalf, and confirming that the BCFP's lawsuit lacked merit. The court emphasized its finding "that lawyers were meaningfully involved disproves the Plain- tiff's sole theory of liability, and precludes recovery under the Complaint." "The Judge's Opinion thorough- ly vindicates Weltman's processes and is a complete rejection of the BCFP's unfounded allegations," said Scott S. Weltman, Managing Partner at Weltman. "The Judge stressed that the BCFP 'of- fered no evidence to show that any consumer was harmed by Weltman's practice of identifying itself as a law firm in its demand letters,' that 'Weltman's demand letters were truthful on their face,' and that 'Weltman attorneys were meaningfully and substantially involved in the debt collection process both before and after the issuance of the demand letters.'" The BCFP sued Weltman in April 2017 following a Civil Investigative Demand (CID) process initiated by the bureau in September 2014. Weltman engaged Jones Day to defend the lawsuit, which included a four-day trial in May 2018, and maintained that, as a law firm, it was legally allowed, under federal and state law, to provide collection and legal ser- vices, and that the firm was being truthful with consumers and factually accurate when it used its name and company letterhead for proper debt-collection activity. "We are grateful to Jim Wooley, Tracy Stratford, Ryan Doringo, and the rest of our legal team at Jones Day for their hard work and tireless advocacy for our position. We are equally thankful for the outpouring of support from our colleagues in the collection and legal communities," Weltman said.